Carr & Westley are a british business who specialise in Womens fashion their clothing is fresh, elegant and coordinated essentially for the classics market with a modern style. 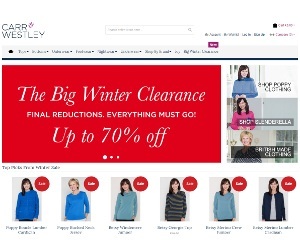 Carr and Westley are currently offering upto 70% off in their big winter clearance. Looking stay ahead in the fashion game then head over to Carr and Westley and grab yourself one of their fantastic bargains.